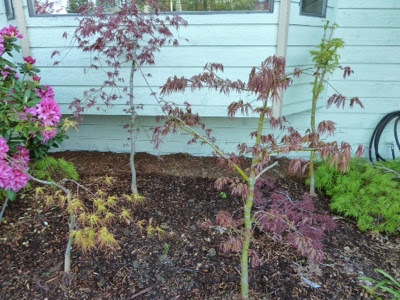 My Home and Garden: Japanese Maples in their new home. As you recall, I dug up four very heavy Japanese Maples a few weeks back. They had already leafed out a bit, so I was worried it might get sunny and hot and kill them. It has been cool and rainy, so they are fine. Better than fine actually. They are growing better than they ever did in the back yard.